My Aunt moved to an assisted living community yesterday and it was a lot of work. I felt badly that I couldn’t help her, but obviously I was in no shape to help. This was a reminder of just how much stuff I have in my home. It’s a very well feathered nest indeed, and way past time some of my treasures find good homes somewhere else. You can see from the picture that it is variegated and has lovely soft colors. 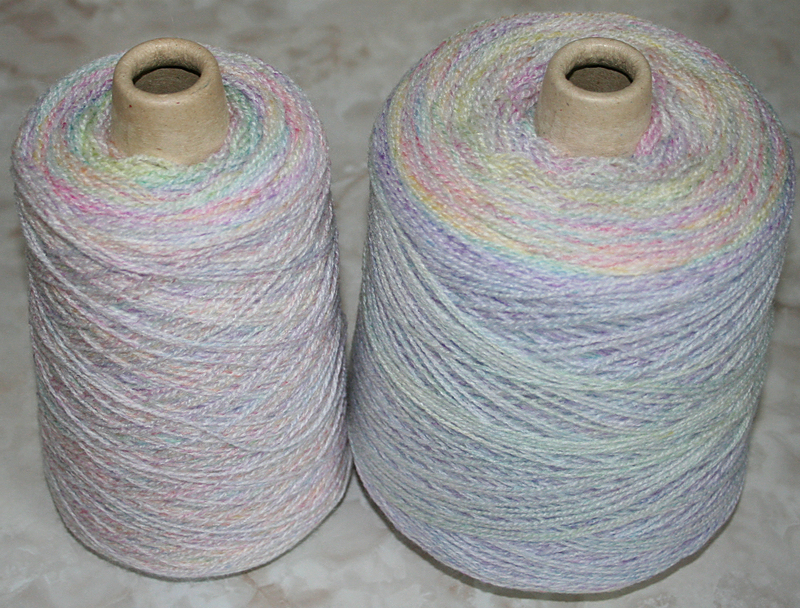 If you’re interested in this yarn, please leave a comment on this post. Tomorrow is stitch removal day. I can’t wait. Aren’t those the neatest ice bags you ever saw? 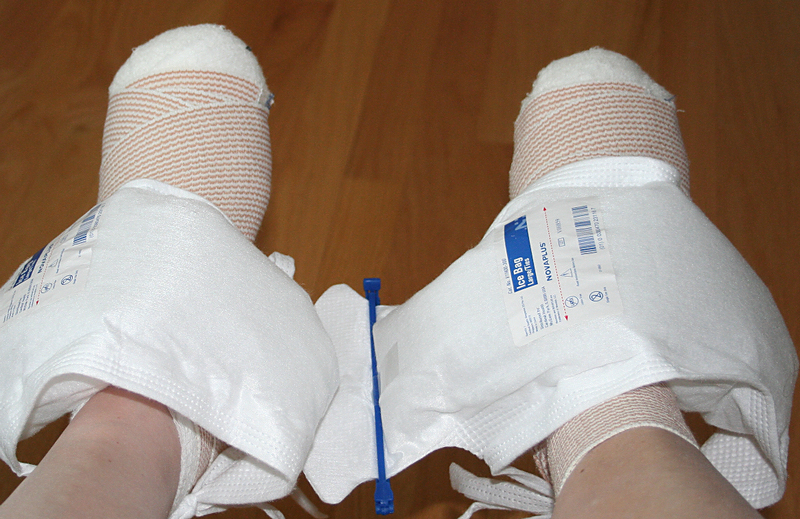 They tie around your ankle, stay in place, and did a super job of keeping the swelling down. The stitches come out Friday, and let me tell you, I’ll be one happy camper Friday. Lots of knitting has been done on my lace sweater. The right cardigan front is completed, and the left cardigan front should be finished today. I’m aiming for the cardigan body to be completed by December 31, 2010. Yes, it’s important to note the year. I started this sweater ages ago (sometime in 2009), brought it with me as my knitting project on our Florida vacation, and put it away when we came back home. The project was picked up again this past fall. With any luck, it will be completed for our upcoming trip to Arizona and Texas. It’s hard to believe it’s December 1st already. The year has zoomed by. Some of my Christmas presents have been ordered on the internet, and some will be purchased locally. I’d purchase more locally if my stores had any inventory, but sadly, they don’t. Even my local grocery store has been disappointing me. They are introducing too many store brand products, and the quality is lacking. That forces me to shop at little import stores or mail order. I guess low inventories are a sign of the times in all types of stores. Happily, my fabric stores are well stocked, and my personal fabric collection can no longer be contained by the shelves, IKEA carts, and closets in my home. Time to make something. It’s on the August 4, 2010 post partway down the page. It took way too long to make as I was using little scraps of fabric for each piece, plus it’s a very busy block because I didn’t do the solid/print combination that Melody used. Also, Melody made her blocks by strip piecing, and it would be much quicker making it that way, but my scrap fabric drawers – yes, drawers – I have 3 BIG drawers filled with fabric scraps, plus a small box – that barely close, contains fabric scraps that are much smaller. I couldn’t strip piece using those scraps, and I couldn’t add one more scrap to the drawers/box. 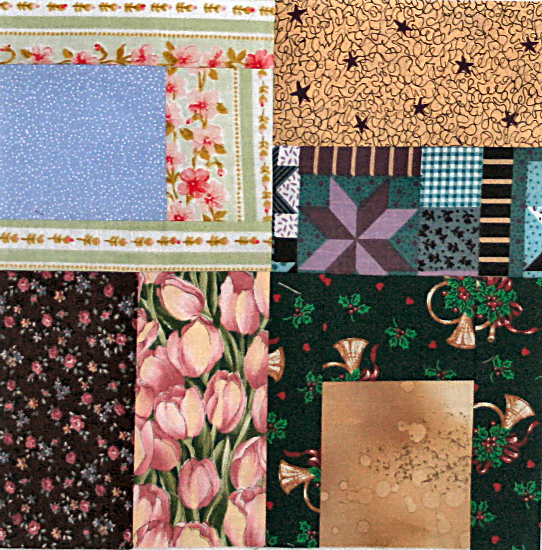 I really wanted to use fabric scraps from those storage areas and those areas only. It’s still using fabric scraps, but simplified. It’s still a 4 patch design. 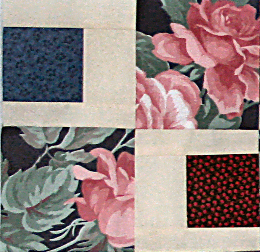 2 of the patches were cut from a large print fabric in one of the drawers, and the other 2 patches were made using 3″ squares from the small scrap box, bordered by muslin. I also changed directions of the muslin bordered patches to make your eye go back and forth horizontally. 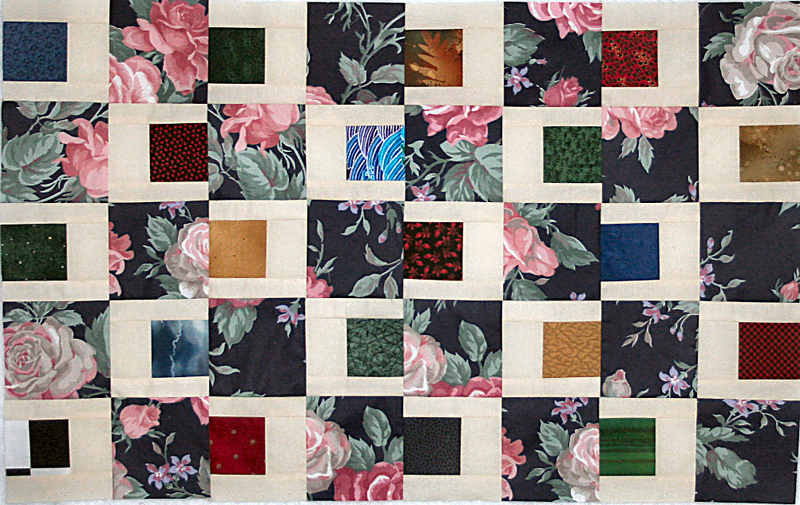 I really like this version, and it will be another comfort quilt. By the way, I barely made a dent in those scrap storage areas, so more projects will be forth coming. 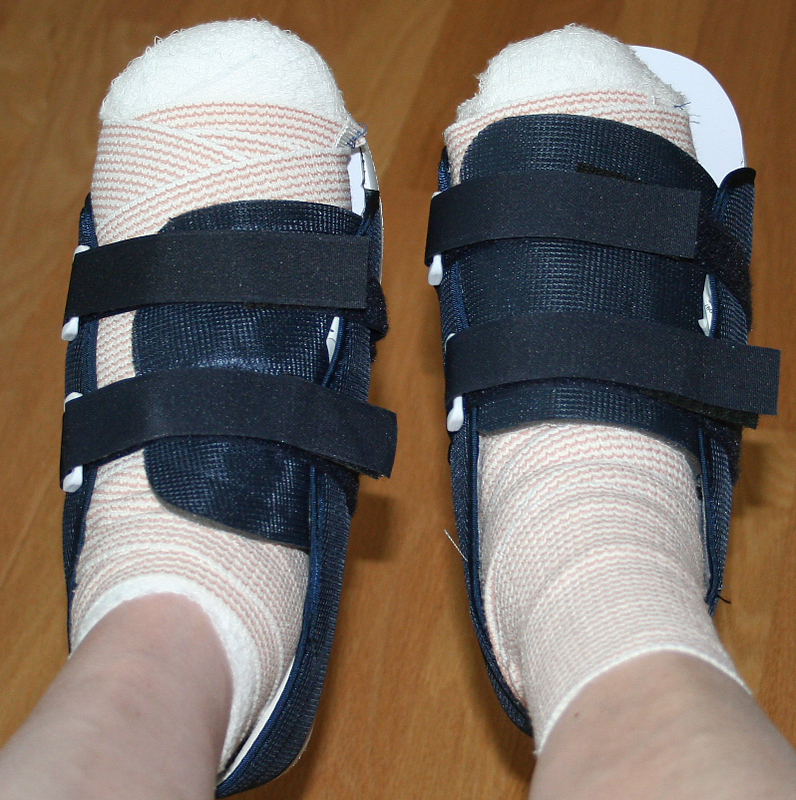 It’ll be awhile though as I’m having yet more out-patient foot surgery next week, and will be bonding with the sofa again for a couple of weeks. No walking for the first couple of days, and then only 15 minutes a day for 2 weeks.